Also sometimes referred to as Fascination, Triangle, Demon Patience, and Chinaman. This is also the same game as the familiar Microsoft Windows™ solitaire. Similar games in Solitaire Plus include Double Klondike and Canfield. This particular implementation of Klondike has no limit on the number of times the discard pile may be recycled. Chance of Winning: 1 in 30 games for three card draw variation. Better odds for one-card draw. 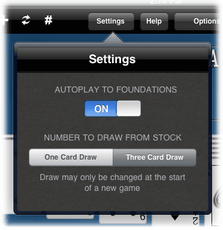 Statistics for one card draw and three card draw are tracked separately.